What type of training do we offer at Hamble Point Sailing School? We offer RYA practical sailing courses, theory courses, and other sailing tuition, sailing on one of the comfortable boats from our fleet. 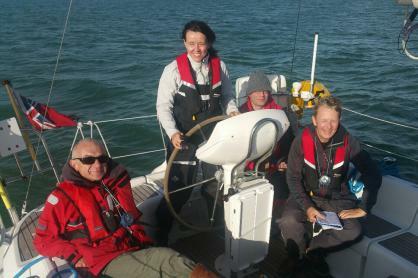 Please have a look at our Sailing school website for more details and to see our course dates. Join one of our scheduled courses with a maximum of five participants run over five days, ensuring space, comfort, time to practice and full attention from the instructor. Instruction for different RYA qualifications possible within the same group. We will discuss your objectives with you to ensure that the content and timing of the course fit your requirements. You will book the yacht of your choice from our fleet at the time that you desire and our instructor will join you on board with any other persons with whom you have chosen to sail. The tuition will typically be run for small groups of friends or family who wish to learn together – own boat tuition without the need to own a boat! Which courses or what type of tuition can we provide?